This image shows the Moon about two days past first quarter. The prominent crater on the terminator is Copernicus, near the southern edge of Mare Imbrium. The dark-floored crater Plato is visible near the northern edge of Mare Imbrium. Mare Crisium is located near the lunar limb. The large maria to the left (west) of Mare Crisium are, from the top of the image to the bottom, Mare Serenitatis, Mare Tranquillitatis, and Mare Fecunditatis. 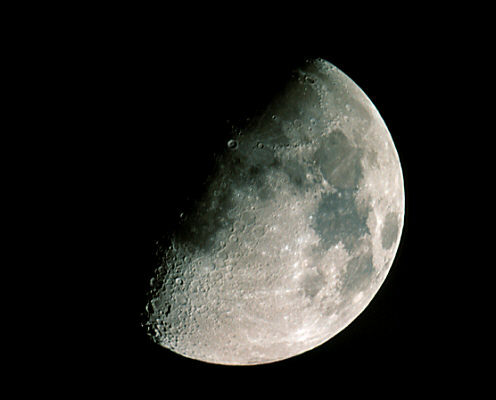 Technical Notes: Experienced lunar observers have noted subtle color variations on the lunar surface. The image above shows subtle color variations, particularly between the slightly bluish Mare Tranquillitatis and slightly reddish cratered terrain adjacent to it. I am not sure how much of this is due to image processing, although I tried to keep the color as neutral and as balanced as possible.